The Search For My Perfect Swing — WHY? For those not interested in all of the technical aspects of Stationary Pitching from 27 feet I am providing the technique with the information in pictures. Standard 1 — A strong balanced stance. Both feet on the foul line will not handle the impetus of the forward and rearward arm swing. Note Line of Flight cord drawn directly from the stake to a location directly below the CofG of the dangling horseshoe. NOTE: Once you have established your stance and upper body alignment, your head, upper body, chest and shoulders MUST NOT CHANGE! Tip 1: Once you have devised a method to make sure you are square to your Visual Alignment Point, you will need to repeat the process on every swing. I have a vertical line on my pitching shirt that I align with the edge of the inside of my left shoe. Tip 2: As with any method of pitching, you must control the tendency to rotate the shoulders counter-clockwise. Once I align my shoulders (See Tip 1), I place my middle finger on my left thigh directly on my front seam. I then lock my left elbow into my body. This will control the left/right rotation. Balanced stance with Line of Flight and VAP cords. Standard 2 — Visual Alignment Point. This is a point to the right of the stake that you personally use to align the horseshoe at address to keep it over the Line of Flight. A good starting point is the right corner of the backstop (typically 18″ to the right of the stake). My personal VAP is at the right rear corner of the distant right approach placing my horseshoes left shank 33″ to the right of the stake and 33″ above the corner. 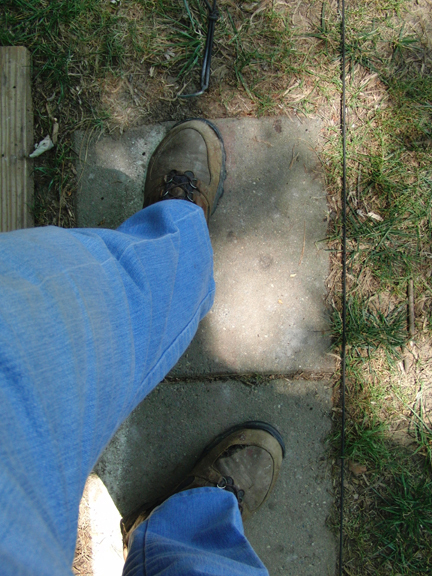 My left foot, chest and shoulders are square and facing this spot (I have a cord drawn from the front of the approach up to this point). When I swing the shoe up to this visual location I concentrate on not moving my head or shoulders during the entire swing. It is important that your left foot, chest and shoulders square up to this point and not change during the entire swing. The reason I pick a point so far right is to make sure that I get the shoe over the LofF on the backswing when I reach my Backswing Stop Point. It has been my tendency to swing outside the LofF if I try swing up and back along the LofF. So, in truth, even though I try to use the pendulum swing up and back, down the same LofF. I consider the backswing a pendulum swing and the forward a pendulum swing, they are not on the same LofF. Standard 3 — Backswing Stop Point. The tamper is positioned directly over the LofF cord and is positioned so that it is touched at the Backswing Stop Point. This technique requires a full backswing. Photo showing the CofG of the horseshoe reaching the tamper at the Backswing Stop Point (where your normal arm swing stops). CofG of horseshoe reaching the tamper at the Backswing Stop Point. From the Backswing Stop Point simply swing the shoe down the Line of Flight. If you don’t reach your Backswing Stop Point your distance control may suffer. It may be necessary to fine tune your stance to accurately position the LofF cord and the Backswing Stop Point. This part will describe a technique to stand at the foul line and throw ringers. It will also cover the exercises that make it possible to utilize this technique. In a nutshell, this is the method. I swing up to a distant target that I will call the Visual Alignment Point (VAP). I swing back to my Backswing Stop Point (BSP) and swing down the Line of Flight (LOF) and release the horseshoe at the stake. A very simple address, backswing and forward swing with release. Lets find a Balanced Stance, Visual Alignment Point and Line of Flight. The only thing that moves throughout this process is my arm…up, back, up. Step 1 — Balanced Stance — Lets take a temporary stance which may change depending on the location of your VAP. This is my chosen setup. My left toe is just slightly short of the foul line and turned clockwise about 10 degrees and pointing at a distant point 33 inches to the right of the stake…my VAP. This places my horseshoes CofG pointing at the right rear corner of the distant approach. My right foot is about 12 inches behind the left and turned 30-35 degrees clockwise. See image below. Step 2 — The Visual Alignment Point (VAP) — This is a location somewhere to the right of the target stake that would be common with most NHPA sanctioned pits. I have chosen the right rear corner of the distant approach. This is a pretty consistent location when pits are 3′ x 6′ and with 18″ approaches. This point is the most important aspect of this method. When you swing back from this point, it must return the CofG of the horseshoe to your Backswing Stop Point (BSP) as well as a point directly over the Line of Flight location. In the image below, I have placed a tamper behind me on the approach. I swing up to my VAP and swing back to my Backswing Stop Point and move the tamper to the CofG of the horseshoe. See image. Return from the VAP. Center of Gravity at the Backswing Stop Point. 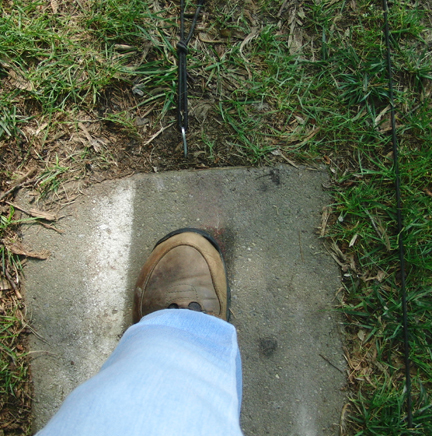 Step 3 — Establish the Line of Flight (LOF) — Now draw a cord/string from the stake to the base of the tamper and if all is aligned properly you simply swing the shoe toward the stake down the line of flight cord. 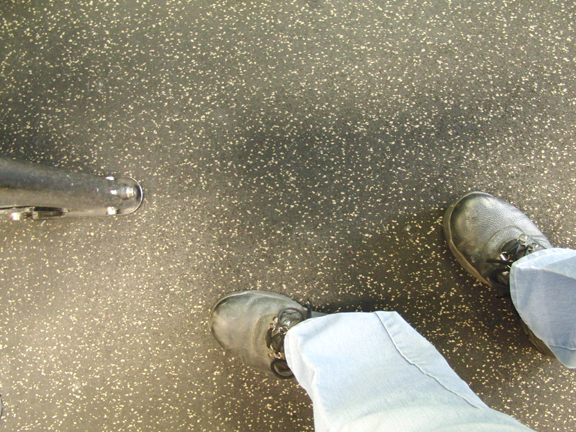 At this point you may need to fine tune the your stance relative so that the CofG of the horseshoe is directly over the LofF cord when the shoe is dangling next to the leg. I wanted this point to be on the right edge of the approach. See image below. Line of Flight cord below tamper. The purpose of this process is to make sure that the horseshoe reaches a point that is on the LofF. It is very difficult to swing the shoe back from the address position and pass it close enough to the leg to remain on the LofF. The Fine Tuning — After you have established your Visual Alignment Point and your Backswing Stop Point and your Line of Flight cord, you will need to take your stance so that your left foot is pointing directly at the VAP and your upper body is perfectly square to this point. Over the past 15 years I have included visits to my local World Gym two to three times per week and have incorporated a variety of exercises designed to strengthen muscles, tendons and ligaments specific to horseshoe pitching. Thus, I have included exercises that target the shoulders, hands and fingers. The one below is the best I’ve found for strengthening the shoulder area and simulating horseshoe pitching as well. All of the equipment in the right background are designed to work the various muscles of the shoulder. See image below. Cable deck with pulley at Backswing Stop Point height. The image below is my stance facing the opposite end of the rack. I want to simulate as much as possible my stance and arm swing to strengthen the muscles of the shoulder. My stationary stance in front of the opposite end of the rack. With rope in hand my target is the vertical bar shown. In the image below the rope has rubber stops on both ends. I grab the end of the rope, step to the other end, take my pitching stance and pull the cable forward to the metal bar at the other end. See image below. Pulling cable to far end. 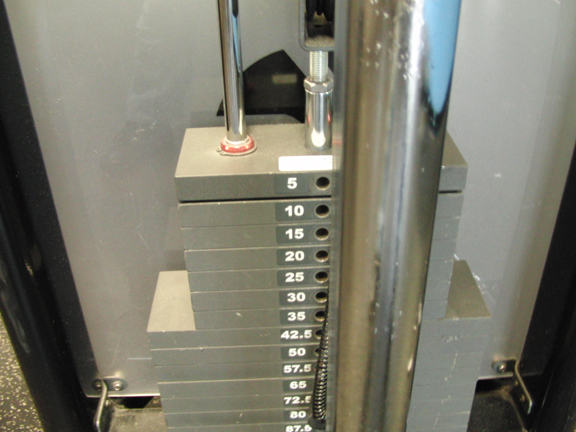 Below is an image of the weight stack adjustable in increments from 5 to 95 pounds. 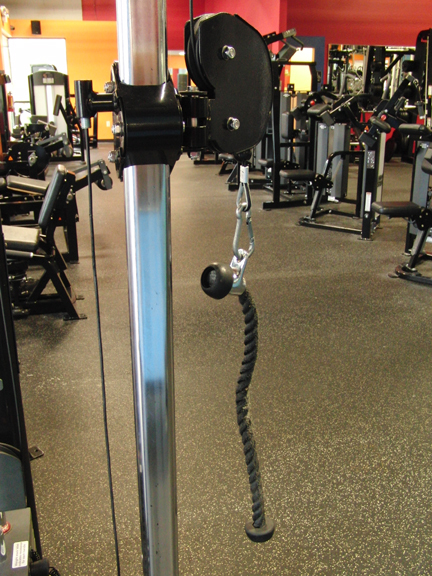 If you have access to this equipment, start with 5 pounds and perform as many repetitions as is comfortable. Continue adding weight in 5 pound increments until you cannot do 10 reps. Make sure you allow our arm to reach it’s Backswing Stop Point. Stop if you have any pain during this exercise. Weight stack from 5 to 95 pounds. This exercise strengthens the deltoid muscle and connecting tendons and ligaments used to raise and lower the arm. However, don’t ignore the other shoulder muscles. Mix in shoulder presses to strengthen the other muscles of the shoulder. Front and rear flys are also beneficial. There are a variety of inexpensive products that can be used effectively at home. The photo below shows two different Surgical Tubes (Surgical in the sense they are normally made from surgical hose). This equipment can be purchased at most sporting good stores as well as fishing supply stores. If you opt to purchase raw surgical hose make sure it is the stretchable kind. Further, start with the weakest strength and work up. The best way to use this tubing is to attach it in some way at the height of your individual Backswing Stop Point. You then simply step forward with tube in hand, and pull against the tension of the tubing from the BSP in a straight line to the front. Two examples of stretchable tubing of various strengths. 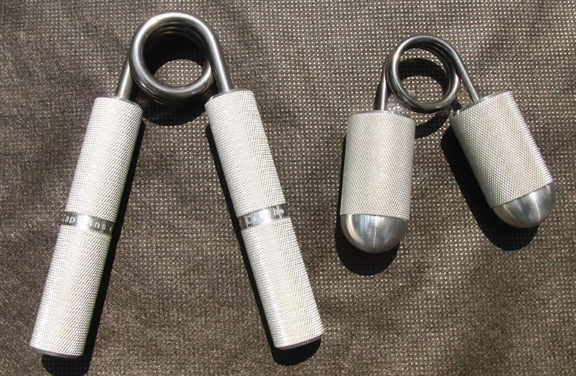 Below are two of my favorite exercisers for improving hand and finger strength. The two shown in the photo come from a company called IronMind at http://www.ironmind.com. They have a very wide array of equipment and books pertaining to all aspects of improving strength. A catalog is also available. 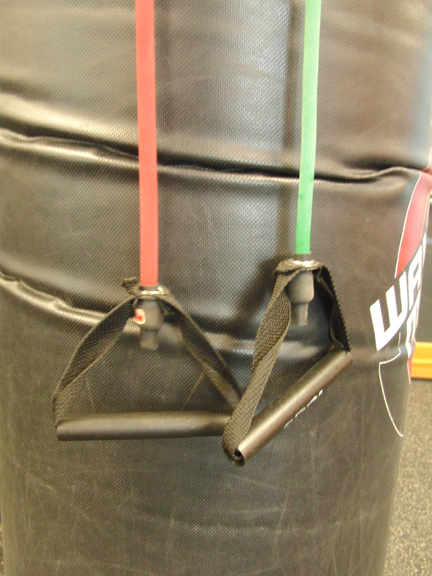 The small gripper below is the Level 1 (IMTUG) and is specifically to improve finger strength (pinch grip). 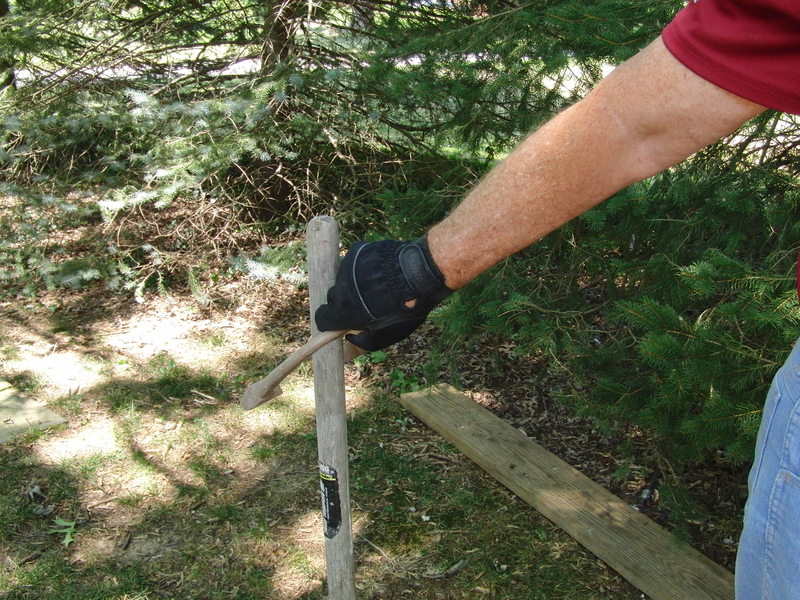 The large gripper is the Trainer (COC) and is specific for improving hand strength. 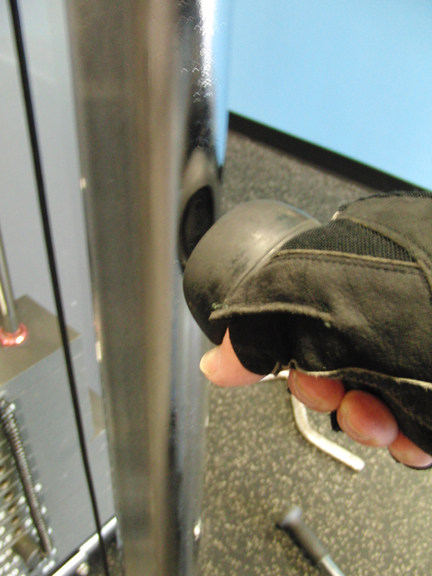 Each would be the starting point to improve your grip and finger strength. There are more levels available. Each one harder to close and chosen, if you desire to continue with improvement. Either of these grippers can be used at any time. You can also purchase these grippers through Amazon. Give them a try, I think you’ll be surprised at how quickly you’ll notice an improvement in your ability to grip your horseshoe and release on time. Continue to Part 37 for a description of how to develop a consistent setup, swing and release directly at the stake. E-mail me if you have questions. 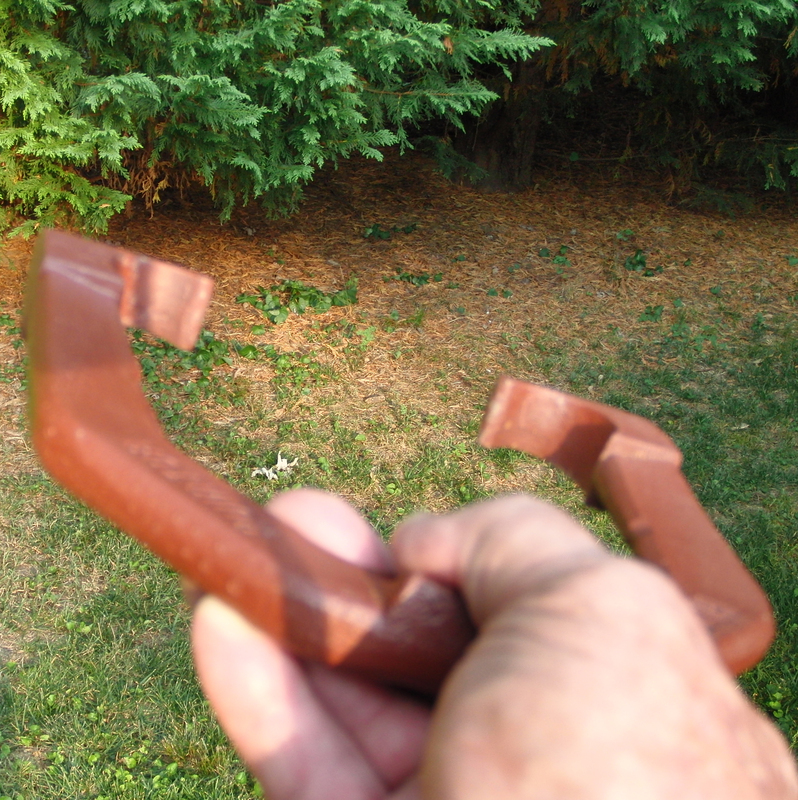 Sorry for the delay in completing Part 35, but, have been having a problem with shipping horseshoes our usual way. We do not charge our customers for shipping and handling over the actual costs through the US Postal Service ($5.15) and a small amount charged by Paypal. Thus, we only charge $6.50 to ship anywhere in the U.S. Unfortunately, the Postal Service has taken exception to the fact that I add additional tape around the edges of the Priority Mail Flat Rate Mailing Envelope and recently charged the customer an additional $6.70 upon receipt. The USPS cited a small paragraph that reads in part “and the contents are entirely confined within the envelope with the adhesive provided as a means of closure.” Well, the contents were entirely confined, and, I did use the adhesive as a means of closure. I simply added regular heavy duty packing tape around the edges to keep the contents from falling out if the cardboard envelope were to tear, which unfortunately happens often. When I ship, I use an additional inner, bubble, tear proof envelope. When the foundry ships, they tightly wrap the shoes in multiple layers of plastic wrap. I simply will not charge the customer $13.20 to ship a pair of horseshoes. We’re looking for a different way and an explanation from the USPS, which I suspect will not be forthcoming, nor, will the customer be refunded the $6.70 by the USPS. Hilfling Horseshoes has refunded the fine. UPDATE 8/17/2012 — The USPS has apparently notified their Post Offices that they are not to add “Postage Due” to any Flat Rate Envelope unless they are grossly distorted. Consequently, we will return to shipping to U.S. Zip Codes for a flat shipping charge of $6.50. That includes a fee of $5.15 for shipping and $1.35 to cover the PayPal fee. The new Flat Rate Shipping envelopes no longer mention the closure method. By specifications levied by the NHPA, the opening between hook calks when measured 3/4″ from the tips, cannot exceed 3-1/2″. There is a fudge factor of 1/8″ on used shoes. However, the Effective Opening should be considered to be about 5-3/4″. The image below will show how this is the case. This is the equivalent of a horseshoe with a much wider opening when factoring in opening to the left and right of the stake. As it turns out, this is important when deciding your aim point. As I walk, my left arm and shoulder rotate rightward as I step forward with my right leg and the opposite occurs when stepping with the left leg. Not only do my arms swing forward, but, they swing inward on an arc toward center. If I were to swing my arm up to perpendicular they would arrive in front of the center of my chest. So, why not take advantage of this natural tendency. Providing for this tendency is the basis for setting up and delivering Square to Square. 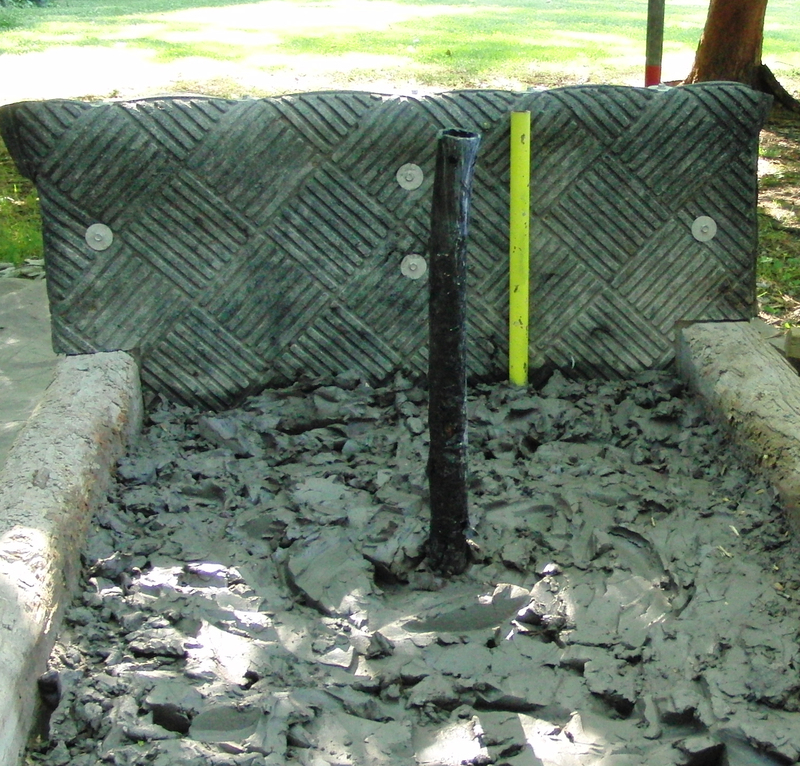 Square to Square is a technique that first requires setting up the pit and approach. Next, it defines my proper stance, body alignment, Visual Alignment Point, backswing and release. 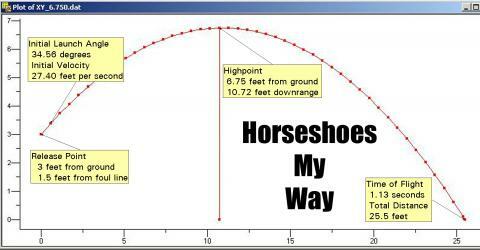 The purpose is to direct the horseshoe directly at the stake with proper distance control. The section on Effective Width is an important aspect of this approach. The pit setup requires two lines secured from the pit to the approach. Line 1 comes from the stake to the center front of the approach. Line 2 takes a bit of explanation. The distance from my nose to my right shoulder is 10″. If I raised my right arm up in front of my eyes I would have moved it 10″ leftward. However, my little laser proves it actually gets there in more of an arc than a straight line. That is an important aspect of Square to Square. If you release a shoe during this upswing, you must provide for the actual location of the release point to determine how far inward your hand has moved. So, to provide for my Effective Width, I painted a second stake OSHA Yellow and drove it 3″ to the right of my primary stake, at the back of the approach. Line 2 is drawn from this Secondary Stake to my CofG location on the approach (right edge). That’s it for the setup. Pretty simple, two lines. 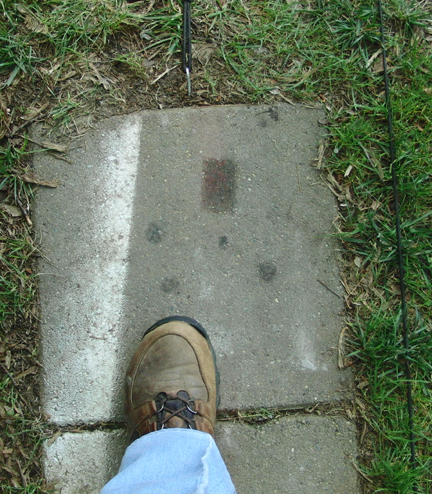 Using this line from the Secondary Stake I found my Visual Alignment Point to be the right corner of the backboard (18″ right of the Primary Stake). See image below. This is the most important aspect of this technique. It’s a modified balanced martial arts stance. Most martial arts schools start with teaching the various stances. This would be known as a front stance. This is also a stance I learned when taking Aikido classes years earlier. The left foot is planted as a continuation of the line drawn from the stake to the front of the approach. The right foot is behind the left foot 12″ and at about a 35 degree angle. I rotate my shoulders so they are perfectly perpendicular to Line 1. It is imperative that I rotate my shoulders to the left to face the stake squarely. If I don’t square up to the stake, my stance is unbalanced and the results are unpredictable. Visually you can check this Square alignment by hanging your arms straight down and making sure they are perpendicular to Line 1. This places the head centered between the two feet. Next, and very important, a slight squat downward so that there is a bend in both knees. This is a well balanced solid stance and capable of handling the swing of the arm and release of the shoe. I also find that if I add a little more weight to the left foot by sliding my upper body slightly forward, my stride forward is much smoother. See the image below. My swing thought here is “QUIET”. From the time I swing up to my VAP and down past my right leg, I don’t want to move my head up or down or left or right. Perfectly still. The only thing moving is my arm. I lock in on the Secondary Stake. 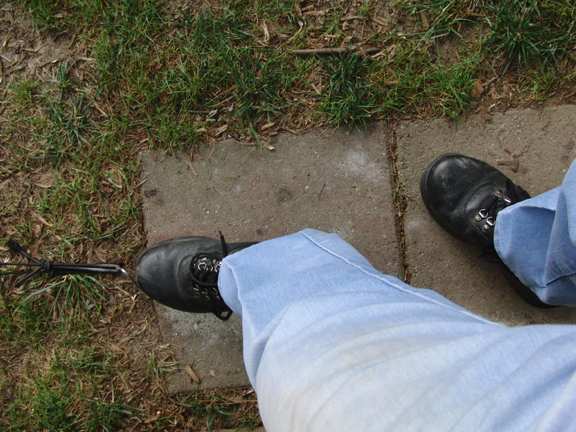 I take a small step forward, plant my left foot, still in perfect alignment with Line 1, keeping my right instep solidly connected to the approach and release the horseshoe toward the Secondary Stake. When I release the shoe my nose is directly over my left knee and instep of my left shoe. By using the Secondary Stake as my target, I am taking full advantage of the 5-3/4″ Effective Width. See Stride Position below. 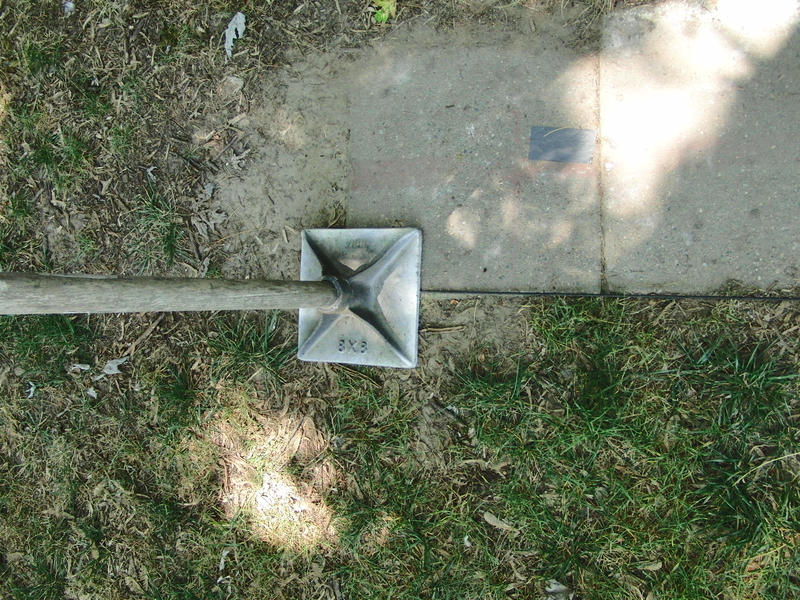 Note that the foot is still aligned with Line 1 to the stake. The feeling of this technique very much reminds me of my release of a duckpin ball thrown directly at the headpin, i.e., toe forward, bend in the knees, nose over the toe and smooth release of the ball at the foul line. Sometimes it is necessary to hit the stake a bit higher to clear a blocking shoe. This is easily done by rising up slightly prior to releasing the shoe. This effectively raises the hub of the arc and carries the shoe a bit higher with the same level of effort. I wanted to post this grip option without delay. 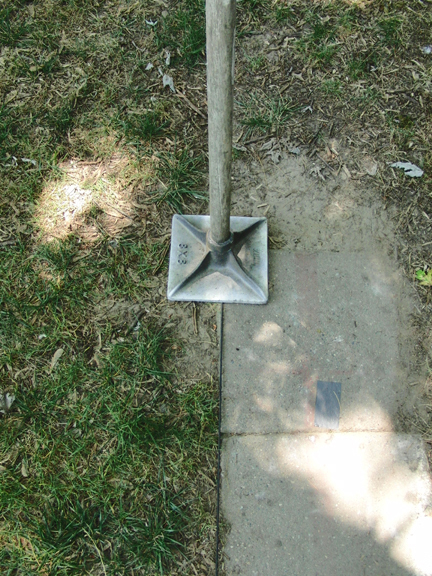 I have always advocated an un-square arrival of the horseshoe to the stake. This includes, arriving un-flat, and slightly rotated left or right (open or closed), anything to disrupt the tendency to bounceback. 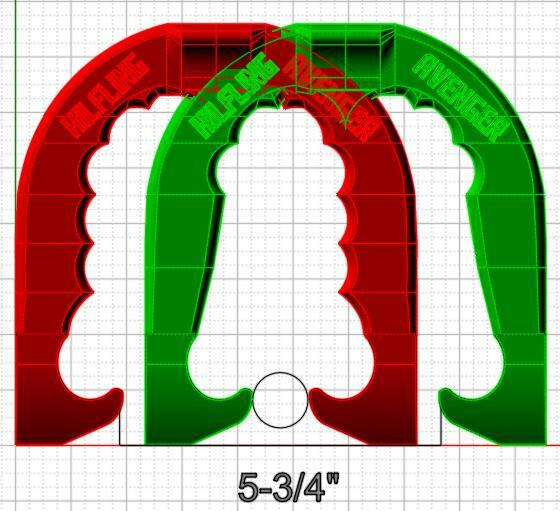 I even designed a horseshoe that would turn clockwise or counter-clockwise slightly prior to arrival at the stake. I have been practicing lately with a new grip alignment that had an added benefit that was unexpected. Here it is — when I take my grip, and swing up to my Visual Alignment Point, I rotate the shoe so that the left shank is higher than the right. This does two things; 1) It forces the forearm and palm to face upward and swings the elbow in closer to the body and extends the arm more fully; 2) It allows the shoe to arrive with the right shank down and eliminates a flat arrival. It is important to keep this grip and arm alignment throughout the swing down, up and release. It also gives me a firmer grip on the shoe. Give it a try. Continue to Part 36 for a description of how to use a pitch by standing at the foul line and helpful Exercises.